This Eagle has the pointed edges of the Aspen Leaf. Black Walnut is the preferred wood. 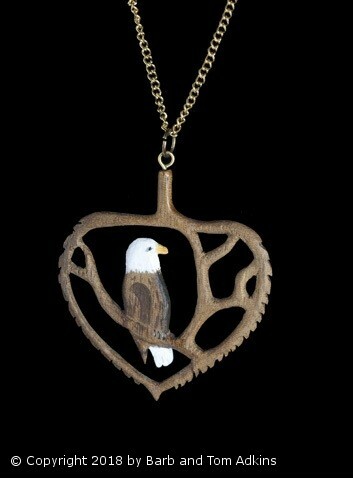 This Eagle Necklace takes a lot of time because it not only has the branches of a tree within the Aspen Leaf, but it also has the many pointed edges that are actually on the edge of an Aspen Leaf. Each point has to be done carefully so the rest of the wooden piece does not break. Chains can be 18' 20" or 24"